I think my husband thought I was crazy when I ordered this - it's definitely not your ordinary lighting. I used it over our kitchen dining table when we remodeled and did an open concept dining/kitchen/living area, and this really classes the place up. I would definitely buy this again. Quality is great, looks are out of this world cool. Quality is definitely 5-star. 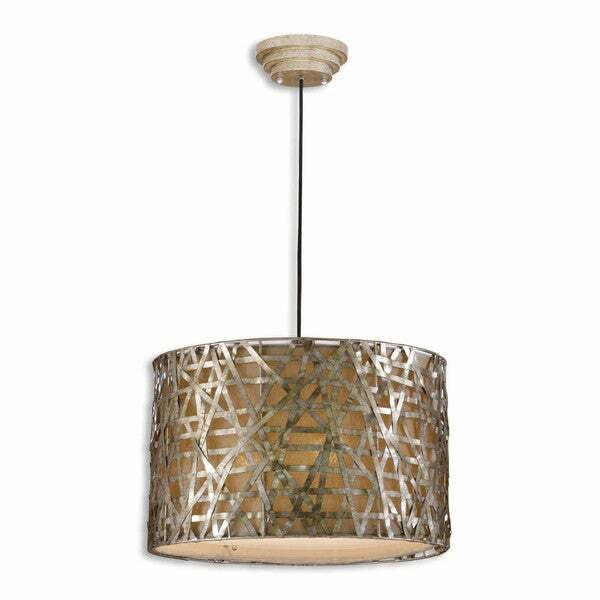 Combine modern drama with Old World charm when you install this Alita three-light metal drum chandelier-style pendant light from Uttermost. Hang this beautiful fixture in your dining room or vaulted-ceiling entryway for centered light that flatters your guests and your room. The retro-style metal frame enhances the champagne fabric shade that fills your room with soft ambient illumination. The black dry-brushed metal drum frame adds a sophisticated charm to your room. A generous eight-foot cord adjusts to the height requirements of your room and lets you create a unique and custom look in your chosen space. We purchased this to go over a dining room table in a vaulted, slanted-ceiling room. It looks amazing and we've received many compliments! The style is such a nice blend of contemporary with natural materials and warmth. I think it would blend with many decors. Overstock did not send me the Champagne they sent a gold color. I bought it for a new condo was was renovating and didn't open it right away. I'm sure the time was long past to swap it so I used a metallic paint (dabbed the metal strips) to change the color. It looks good but I'm sure the champagne would have worked better. My fault for waiting two months to open the box. We had to send this light back b/c it was too big for our space, but its absolutely stunning if you have the room for it. Great quality. 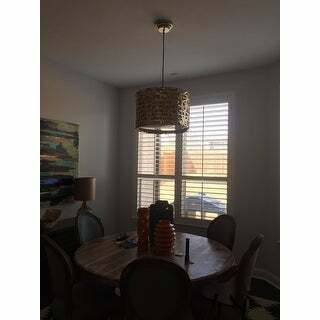 I installed this light in dining area, hanging over my round dining table. Lots a compliments. I also purchased the matching mirror which hangs above my buffet table. Looks just beautiful together. This light is pretty large and well made. The electrician who installed it commented on the high quality. A very striking light and just what we wanted. I love the style of this light, but it's super cheap. For almost $4** I would have thought that it would have been more sturdy and solid, but it's very flimsy and the "metal" bends with a simple touch. Since it hangs high it's not that big of a deal, but I'm pretty disappointed at what I got for the amount I paid. A more Appropriate price would be in the $*** range. We love this light in our breakfast nook, but I was hoping it would have been a better mix of metals. It is very gold, much more gold than nickel. "Whats the shipping weight including the packaging?" "Can I hang this on a sloped ceiling?" Hello jmsbis, no, it cannot. Thank you for shopping with us! "Can his be installed as a semi-flush mount ?" Hello sarahg678, thank you for your inquiry. Unfortunately, the information you have requested is currently unavailable. We will continue to try and answer this for you. You will receive an email notification once an answer is posted. Have a great day. "What is the width of this light? The review says 20in diameter in one place and then 16 or less in another." Hello bostonamy11, I'm sorry for the confusion this is 22 inches in diameter. Have a great day!